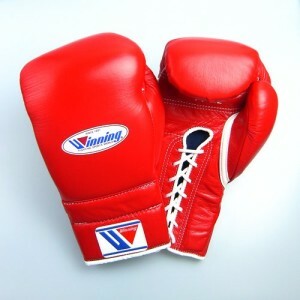 Winning boxing gloves are renowned for their quality in craftsmanship, foam and leather materials, and overall comfort. The company has produced boxing gloves for decades that have been used by world championship boxers like unbeaten Floyd “Money” Mayweather and Filipino boxer, Manny Pacquiao too. The quality of the leather, the comfortable padding inside each glove and the design are all top notches with Winning products. That excellence doesn’t come cheap though. Often, new boxers start with inexpensive boxing gloves and find that as they learn to hit harder in sparring, pad or bag work, their knuckles begin to suffer from the impacts. They then choose to make the investment in a better pair of gloves that protect their hands and will provide long-lasting use. What can we say about Winning boxing gloves in general? There’s certain sticker shock for young boxers looking to pick up a pair. You do get what you pay for though. Quite often, boxers buy lesser pairs of gloves initially before finally deciding to pick up some Winning gloves for their training sessions. They then do not look back. Here we look at three Winning boxing gloves to see how they stack up and which might be most suitable for a boxer in training. 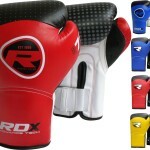 The Winning 16-ounce boxing gloves designed for training come in 14 different colors. There’s everything from white to red to navy to yellow here. It’s sure to suit the toughest shopper and match your boxing shorts too! The 16-ounce weight is ideal for training on a heavy bag, for mitts or sparring. 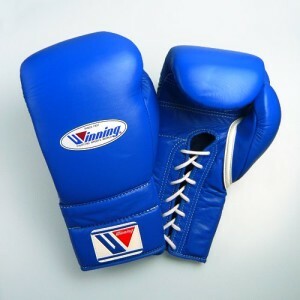 You won’t have any trouble with a gym accepting these gloves for sparing and other forms of boxing training. There’s an anti-thumb design to the thumb section to avoid injuring your thumb and positioning it incorrectly. The big difference between these Winning training gloves and the other two products reviewed above is that these are lace-up models, not Velcro ones. The use of lace-ups makes them slower to put on a take-off, to be sure, but the upside is that there’s greater wrist protection through the elongated wrist length for boxers who tends to have difficulty with weaker wrists or injure their wrists easily and have been advised to avoid Velcro enclosure training gloves for this reason. Depending on how tightly the gloves are laced up, they may breathe a little better than a Velcro model too, so sweat build up on the interior might not be as much of a problem here. The same soft plush leather finish and comfortable padding on the interior is felt when sliding these premium gloves on too. The padding benefits from an even balance through the glove which provides equal protection for the hands throughout. For the fitting, Winning gloves are known to have a slimmer profile and a tighter fit on the hand. This product should not be expected to be any different. 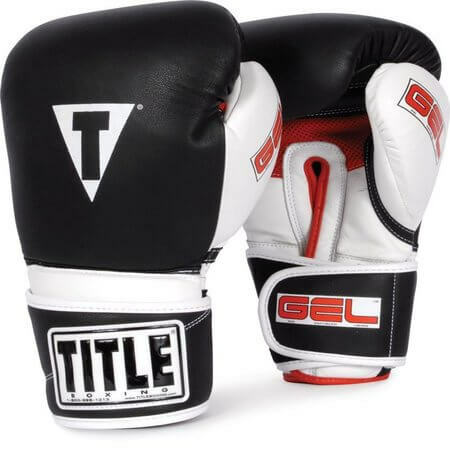 The Winning 14-ounce training gloves come with a similar wide Velcro enclosure to cinch the gloves closed and create a tight fit above the hand wraps. The 14-ounce size is ideally for middleweight boxers and other weight ranges, along with people with larger hands than normal who need bigger gloves. The size is the minimum size that the majority of gyms will accept for boxers to use for mitts, bag work or sparring. This is to provide adequate padding to protect your knuckles, hands, and wrists, along with the body of anyone that you agree to spar with too. Unlike the previous 16-ounce gloves, these 14 ouncers come in 4 color choices: black, orange, blue or white. The stitching color is different with each model glove and matches perfectly to not stand out unnecessarily. The underside of the thumb guard is white and the middle slot on the underside with the Velcro closure above it is also white, which provides some blended color balance. These gloves provide a perfect balance for both bag and mitt work. Sparring is also possible because their 14-ounce weight is acceptable to most. The leather is softer and feels plush compared to some other brands. It does wear in over time and becomes more weathered, but it still feels excellent. Perhaps compared to some other brands, these gloves are a bit of a closer fit. If you tend to add more hand wrap than most, then perhaps the 16-ounce glove might be better, otherwise, these should feel secure on each hand. The additional padding present in Winning training gloves, along with its softer feel on the interior, means that the knuckles often get greater levels of protection. I wouldn’t say it’s “pillow soft” as some people have stated previously in the press, but generally, it’s a softer, more comfortable feeling on the interior than other boxing glove brands. That certainly a truer statement about how these gloves feel. The Winning 16-ounce glove product comes in 16 color choices to really get exactly what you want in a boxing glove. There’s gold, black, navy, pink and just about every color combination in between. 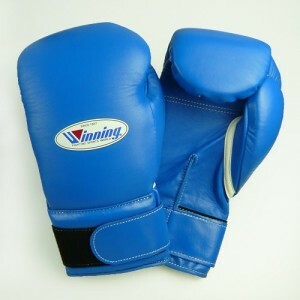 The gloves have a Velcro enclosure rather than using laces which makes it easier to both adjust its fit and remove the gloves after using the mitts, sparring or punching the bag. This is fairly common with boxing gloves for quick removal to switch out gloves for different training activities. The 16-ounce version is intended for the heaviest of hitters, people with larger hands or heavyweight boxers. For people with smaller hands or who don’t hit as hard, these gloves may be too large. 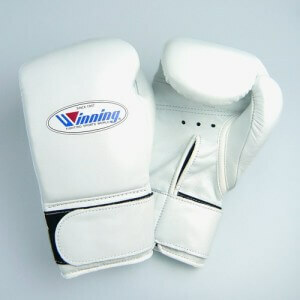 However, when sparring, many gyms will require either a 14-ounce glove or a 16-ounce glove to avoid injuring either yourself or your sparring partner in the ring. When comparing boxing gloves with the same ounces, a pair of Twins tends to feel heavier than these ones due to their design. When working out on a heavy bag that’s over 200-pounds or heavier, the Winning Velcro training gloves protect the hands better than many other brands are capable of. While your knuckles will still feel as if you punch hard enough or for long enough at the heavy bag, as protection goes, it’s difficult to find better. There’s no membrane or air holes to let the inside of each glove breathe, so with an intensive workout, they’ll build up a sweat inside. However, when getting the appropriate size gloves for your hands, they don’t move around inside when working up a sweat. This helps to avoid injury and makes the feeling more pleasant too. It is a good idea to let these dry out with the hand opening facing the breeze. You can expect them to take longer to dry than a lesser brand. With the Velcro rather than lacing enclosure, there is less wrist support. It is a good idea to increase the taping of your hands to provide greater support to counterbalance this and avoid a wrist injury. This is not something particular to this product or Winning boxing gloves; any training glove with Velcro enclosures has this same downside. As with many of the Winning products, the Japanese manufacture is dependable here and worth the money. 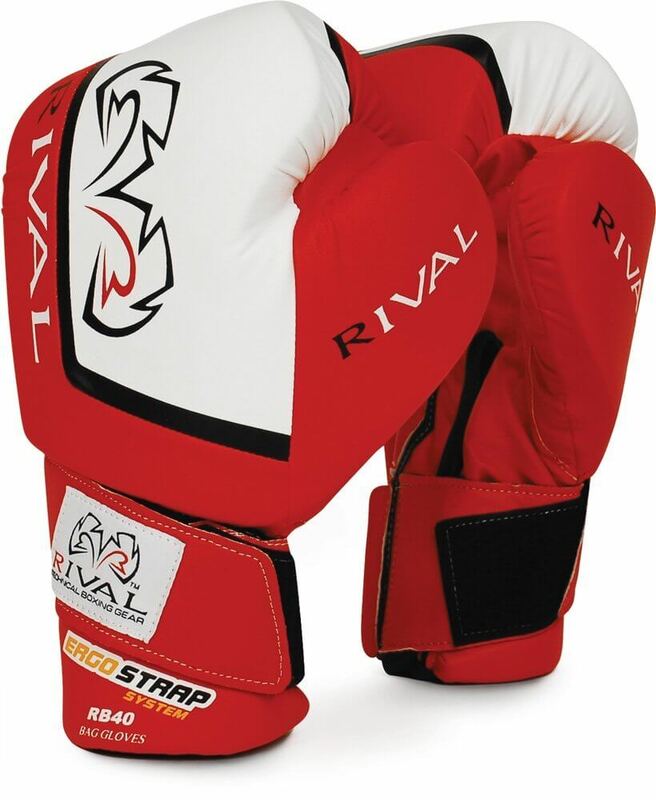 These Winning 10-ounce gloves are for training with mitts and also against the DE bag. 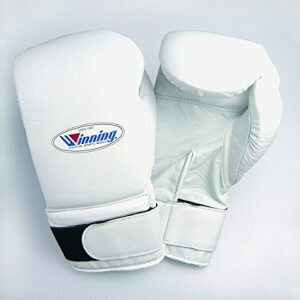 An uppercut bag and a heavy bag are also supported because these gloves are made of thick, durable leather. The finish is glossy, and there’s a distinct leather smell to the gloves when first taking them out of the carefully packed box. It’s sometimes the case that leather boxing gloves will see their colors fade through prolonged use, but that is doubtful here. The leather will suffer wrinkles through, but it will not crack through. The interior lining is a combination of polyester and nylon. Both the leather and fabrics are made in Japan. There is a color choice with black, white and blue as the three options. The white lacing matches the same color strip below the thumb area. The laces are soft but likely will hold up. They do lack the small plastic ends one usually finds with laces, but they can be replaced easily if they begin to fray at the ends. The best thing when using these gloves is their performance when hitting pads. The internal padding on these 10-ounce gloves is better than one expects for a product of this size. The level of protection might even match heavier gloves with more padding, so clearly, the material used by Winning is top quality. While some 10-ounce gloves will cause boxers to worry that they’ll injure their hands, it’s fair to say that with these you need not worry. Manny Pacquiao has been using 10-ounce Winning gloves for the past couple of years which is proof enough for most professional boxers and amateur boxers alike. Overall, it’s tough to fault this pair of Winning gloves. The Japanese quality in leather, lining material, and stitching is clearly evident. The leather smells good and wears in well for long-term durable use for training purposes. These are Winning 12-ounce boxing gloves for use strictly during training and not a real boxing match. The product is available in black, red, blue and white color schemes. In each color scheme, there is a white section below the padded thumb area. The Velcro strip is black with the main leather strap going over the top of most of the Velcro material when securing the glove properly. There is also a separator down the top-middle of the back of the glove which enables boxers with wider hands to lets the glove expand to make it a little more spacious on the interior. The Velcro securing allows customization of the fit to suit different hand sizes. These boxing gloves are 12-ounce ones. They have a bit more heft and padding to them that the Winning 10-ounce products which show in the pounding that punch bags and uppercut bags can take during the training process. Sparring is more interesting because shots are pushed through harder and for boxers who fight with heavier gloves, the hands get used to the extra weight over time. For anyone worried about the lower weight of each glove, the 12-ounces is a good balance during training. The leather is excellent here. Tough, smooth and durable. It will wear in over time, but won’t crack or get damaged during use. The packaging of the product is well done to ensure the gloves arrived unblemished too. The lining is made from a mix of polyester and nylon. The combination is a potent one that protects the hands. The padding is an improvement over cheap boxing gloves of the same weight that offer less protection during long training sessions. The craftsmanship here is excellent. Quality materials and manufacturing directly from Japan. The leather is strong but super-soft and smells lovely out of the box. 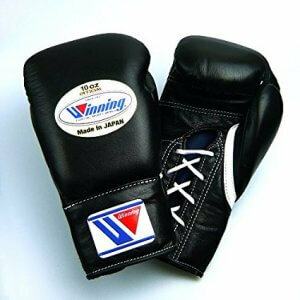 Whether looking for a pair of 10-ounce or 12-ounce boxing gloves, these luxury Japanese versions by Winning having stopping power. The padding is superior to what is found in lesser brands and cheaper models. The leather used is also excellent with a plush, soft feel that’s almost like a kiss on the cheek or body of the boxing opponent when you land a shot. The interior lining is durable and comfortable for prolonged wear. What you get with Winning gloves is a solid producer of a dependable line of products. They aren’t the more affordable products, but they are high-quality and long-lasting making them excellent value over the period of ownership which is how the cost should be judged. There are many boxers who swear by Winning gloves and will pay the premium to get their quality. It’s hard to argue with that. You get what you pay for. For any boxer focused on their chosen profession who takes their training seriously, Winning gloves are an excellent choice.